BOSTON, January 19, 2010 – Technomad LLC, a leader in weatherproof loudspeakers and Turnkey PA systems for the commercial pro audio market since 1995, welcomes three new companies to its dealer network in Europe and the United Kingdom. POGO Geluid of the Netherlands, Lynden Micros Ltd. of England and Prosound Munster of Ireland are the latest dealer representatives to join the growing network. The dealer network expansion follows a year of steady business growth in Europe following the company’s announcement that it would begin stocking equipment in the Netherlands. The overseas warehouse has enabled faster delivery and reduced shipping costs to Technomad customers across the continent. John Futter, Managing Director of Lynden Micros Ltd, said that Technomad’s range of weatherproof loudspeakers has proven popular for custom projects where quality of sound and durability are key requirements. He points to recent projects at the Worcester Rugby Club in Wales, home of the Worcester Warriors; and the Blackgang Chine Amusement Park on the Isle of Wight as examples. Leontine van der Poel, Managing Director of POGO Geluid, added that Technomad products offer a unique design in Europe compared to other loudspeaker and PA products. She cites a recent Technomad installation by her company at Feyenoord, a major league football (soccer) club in the Rotterdam area, as an ideal example of the professional audio niche that Technomad fills in her region. All Technomad products are completely RoHS-compliant, and the company employs a green design process that includes the use of 100% recycled plastic in its manufacturing process. 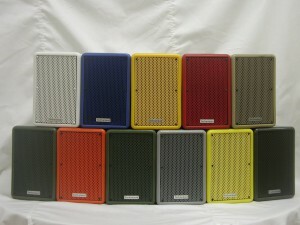 Technomad continues to manufacture its products at its U.S. factory in South Deerfield, Massachusetts, including its complete range of IP56-rated weatherproof loudspeakers; its PowerChiton range of networkable weatherproof outdoor amplifier modules; and its Schedulon mp3 player and recorder. Technomad also offers its Online Quote and Order System to dealers globally, which brings the conveniences of online purchasing, parts replacement, quote generation and other benefits to its network of authorized dealers and resellers.